Thank you for choosing me to capture priceless memories of your growing family! Before your session, please review the following information. And please don't hesitate to contact me if you have any questions. Newborn photos are best taken shortly after birth, usually within the first ten days of life, and must be done within the first two weeks. 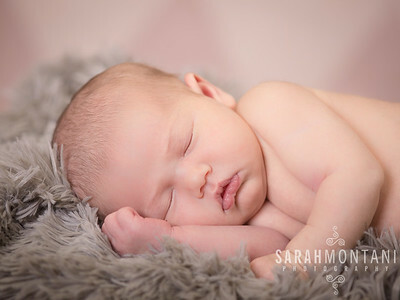 Newborn sessions are most successful when the baby is sound asleep. Often parents try their best to keep the baby awake for the hour before their session. Our first goal upon your arrival will be to try and get the baby to sleep. Plan feed your little one as soon as you get to my studio - the baby will be more content with a full belly and more likely to snooze and snuggle throughout your session. The session is done around the baby’s needs. We will take frequent breaks throughout the session for feeding, changes and soothing. Try to arrive at the studio 5-10 minutes prior to your session time. This gives us time to get introduced and prepared. It's important not to be late, but if you do run late. please contact me at 508-397-4270. Keep clothing simple on your little one. Often a simple "onsie", a swaddle blanket, or a diaper works best. I also have a number of newborn wraps you can choose from. We will also do some with no clothes at all. If you want to have your baby wear an outfit, please make sure it fits properly. It will be very WARM in my studio to help the baby stay nice and sleepy, so parents and siblings should wear cool clothing or layers, so they don't over heat! Please be prepared with spare clothing for both the parents and baby, as wet or soiled clothing are very common during a newborn session. 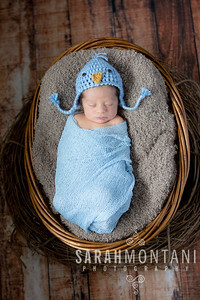 My studio contains a number of props for posing the baby and personalizing the portraits. Personal items are also welcomed and encouraged to be used as props. If you have any special items from home please have them handy for the portrait session. Handmade blankets, special gifts, etc. Even if we don’t get to everything, the more we have on hand the better! If you are looking to utilize any specific props, or have a specific theme, please inquire in advance. Some popular themes include sports, animals, and military service. Parents and older siblings are welcome to join in some portraits with the baby. If other family members will be in the photos, please make sure clothing is complimentary. Solid, neutral colors are best. 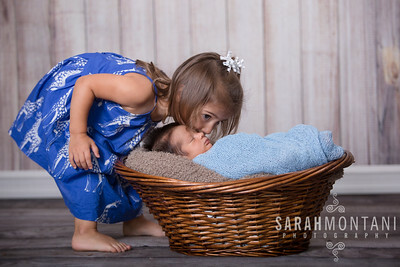 Siblings can also have a few photos taken of just them! When bringing siblings, it is often best to bring an additional family member or baby sitter to take them home after their portion of the session. If they have to stay for the remainder of the session please bring some snacks, toys, or books to keep them entertained.